Here at DataSpace we provide our clients with options so they receive the exact services they require to suit their exact needs and budget. Bulk Scanning Services. 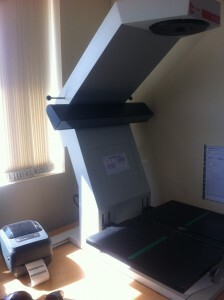 DataSpace have high capacity scanners and are able to scan thousands of imager every hour. Scan on Demand. This solutions allows you to store your documents offsite at our secure storage facilities and request items to be scanned as and when you need them. Scheduled Scanning Service. DataSpace will arrange regular collections of your physical files so you can keep on top of digitising your files. Alternatively you might require a mixture of our solutions. DataSpace unlike many other Document Management companies will mix and match our services so you get the best service and the best price to suit your requirements. DataSpace can provide scanning services for many items including; Receipts, Wills and Deeds, Maps, Books and Brochures, Photographs and even legacy data recorded on Microfilm, Microfiche and Aperture cards. We are able to save your documents in PDF, JPEG or TIFF files. Once your data has been scanned it can be saved on CD, DVD, portable Hard Drive or access online on a secure FTP via FileLive our secure portal . We ensure that our services are the best to suit your needs but we also ensure our facilities are the best too! All of our staff are fully employed and CRB cleared and sign non disclosure documents upon employment. DataSpace are also BS:5454 and BS:27001 accredited so you can rest assured that your documents are in safe hands. For further details on how DataSpace’s Scanning Solutions could benefit your business and a FREE quotation please call 0800 028 8956 or email info@data-space.co.uk.